« Machane Yehuda- Yehuda Chamutzim Nabbed! Veterinary inspectors have apprehended Yehuda Chamutzim selling tainted chickens believed from PA (Palestinian Authority) controlled Ramallah. He was apprehended bringing chickens from an “unknown source” and they were not properly refrigerated. The store advertises itself as kosher under the mehadrin supervision of Badatz Yoreh Deah, Rav Machpud, when in actuality, the store has no supervision whatsoever from the Jerusalem Religious Council. (See photo item 2 of Hebrew update below). The kashrut supervision on this business has been removed. The local religious council announces to the public that it is no longer responsible for the kashrut integrity of anything produced in the firm’s factory. 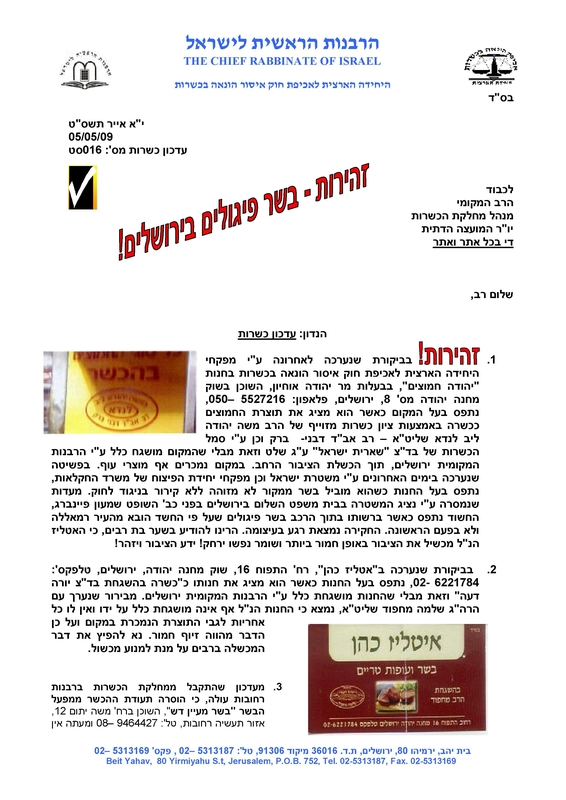 Following is a list of businesses illegally displaying kashrut certificates or have had their kashrut supervision revoked. 1. Dr. Lack meat and dairy catering. 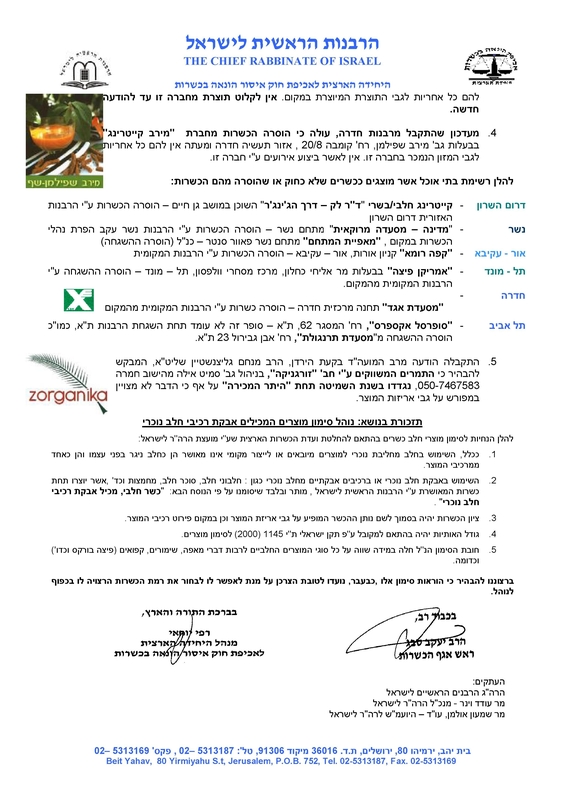 Derech HaGinger near Moshav Gan Chaim – the S. Sharon Rabbinate has revoked its kashrut supervision. 2. Medina Moroccan Restaurant. The kashrut supervision was revoked as a result of failure to adhere to kashrut guidelines. 3. HaMitcham Bakery – Nesher Power Center. The kashrut supervision has been removed by the local rabbinate. 4. Roma Café –The local rabbinate has removed its kosher supervision. 5. American Pizza – owned by Eli Kachlon – Wolfson Shopping Center – The local rabbinate has removed its kashrut supervision. 6. Egged Restaurant – Hadera Central Bus Station – The local rabbinate has removed its kashrut supervision. 7. SuperSol Express – 62 HaMisgar Street – The store is not under the supervision of the Tel Aviv Rabbinate. 8. Tarnegolot Restaurant – 23 Even Givrol Street – the local rabbinate has removed its kashrut supervision. REMINDER: Regarding products containing ‘nochri’ (non-Jewish) milk powder. Nocohri milk powder is not imported or locally manufactured as a separate entity but as a component of other ingredients. Items containing nochri milk powder must be marked accordingly. The kashrut supervision should be printed near the item’s product name and near the area of the ingredients. The size of the fonts must comply with kashrut laws. These parameters include baked items that are dairy such as frozen pizza and burekas, cakes and other yeast dough products. Posted on May 6, 2009 by JKN Israel. This entry was posted in 5769 - 2008/2009, Chief Rabbinate Updates. Bookmark the permalink.